Last time I explained that a screen in the NES game Faxanadu is made of 16x13 blocks and how the block data is stored in the ROM file. In today's update I'm going to describe how these blocks are displayed by the PPU (Picture Processing Unit). The PPU has two pattern tables that are used to hold the objects to be displayed. The first one is used for sprites, the second one (which is relevant for today's update) is used for everything else. Each of these two pattern tables can hold 16x16 = 256 patterns. Faxanadu divides the 2nd pattern table (pictured on the left) into two parts: One ranging from offset 0x00 to 0x7F and one ranging from offset 0x80 to 0xFF. Strictly speaking the exact start of the 2nd part depends on the screen to be displayed, but more about that later. The upper half of the 2nd pattern table contains patterns for things like the health bar or the text if you're talking to an NPC. The lower half of the 2nd pattern table contains the patterns used for painting the background of a screen. 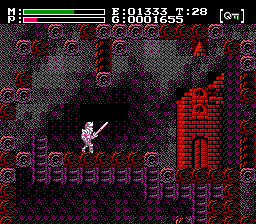 Continue reading "Faxanadu level data - Part II"
My Faxanadu level editor is coming along nicely so it's about time I write another update on the internals of the game. Today's post is the beginning of a mini-series about the data the game uses to create levels and to display them on the screen. Most of the mini-series is based on Vagla's document. Whenever that document is incomplete or erroneous I'm going to try my best to correct the information from there. - Screen data: A screen consists of 16x13 blocks. This data defines which blocks appear on a screen. - TSA (Tile Squaroid Assembly) data: Each block is made up of 4 tiles. Which tiles these are is stored here. - Block attributes: Defines the palette to be used when drawing the tiles of a block. - Scroll data: Defines on what edge of a screen it's possible to leave the screen. - Door location table: Defines where doors are located. - Door destination table: Defines where doors lead to. - Palettes: Defines which colors are used to draw a screen. Today's part of the mini-series begins with the first step: The screen data. But before I'm going to explain how to read that data I'm going to give a brief overview of how the data is stored in the file. Continue reading "Faxanadu level data - Part I"
As I had promised in my last update here's a complete discussion of the mantra checking code of the NES game Faxanadu. If you don't know the 6502 assembler instructions yet now might be the best time to read about them. Here are some prerequisites you need to know before you can fully understand the code you will find in the rest of this post: The mantra is a password that can be 0 to 32 characters long. There are 64 valid characters (A-Za-z0-9,?) that can be used in mantras. They are represented in memory by their numeric value. The numeric values are between 0 for the character 'A' and 0x3F for the symbol '?'. When a user enters a mantra this numeric data is stored in a 0x20 bytes long field starting at memory offset 0x600. In the following code the data in this array is transformed and stored in another array starting at 0x4CD. Let's recall what I had already posted last time, the code where the mantra is checked for validity. Continue reading "Faxanadu Mantras - Part II"
If you've never heard of Faxanadu I'm afraid I have to inform you that you've missed the best game ever produced for the Nintendo Entertainment System. I've been waiting for a sequel to this game for 17 years now but Hudson Soft let me down. Seems like someone else has to produce Faxanadu II and I've decided that this someone is me. Patching an original Faxanadu ROM (the US version) seems to be the way to go. As a consequence I've strayed away from the good old x86 CPUs in the last days and focused on 6502 assembler which is used by the NES. Now that I've finished my first steps with this system I'm confident that I can program a level editor for Faxanadu which is probably the most important step for modding the game. My confidence is based on a fantastic document written by a guy named Vagla I've found online which already contains an enormous amount of information about the Faxanadu ROM. Vagla's document is not complete though and that's why I still have to pick up 6502 assembler if I want to reverse engineer the missing information from the ROM file myself. My first attempt was to reverse engineer a part of the game which I assumed to be both easy to locate and easy to reverse engineer because it does not depend on the underlying CPU: The password generation. 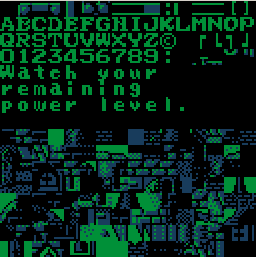 In Faxanadu you can get passwords (so called Mantras) at certain locations that allow you to continue a game later. Continue reading "Faxanadu mantras - Part I"